Ghost, a large installation by the French artist, of Algerian descent, Kader Attia, displays a roomful of Muslim women in prayer. 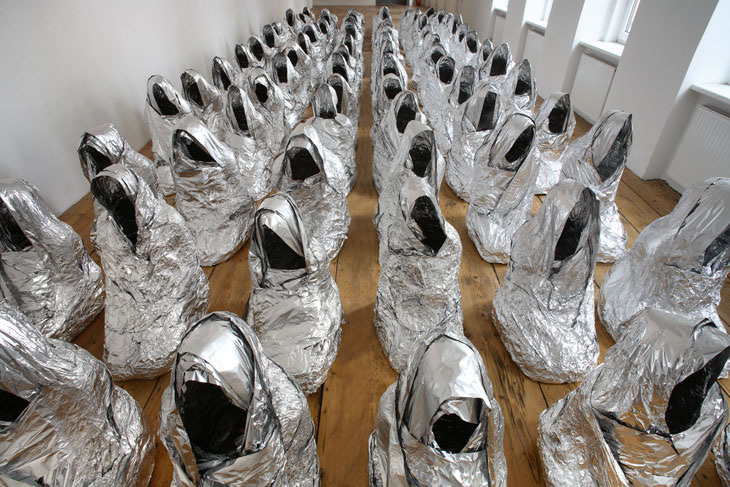 The bodies are rendered as empty shells and hoods made of tin foil, not coincidentally a standard disposable domestic material. These figures become at once alien and futuristic. Bowing in shimmering meditation, their ritual is equally seductive and hollow, questioning modern ideologies – from religion to nationalism and consumerism – in relation to individual identity, social perception, devotion and exclusion. Attia’s Ghost evokes contemplation of the human condition as vulnerable and mortal. Attia’s work explores questions of community, diversity, belonging and exile. There is an emotional, as well as sympathetic, impact in all of his work.